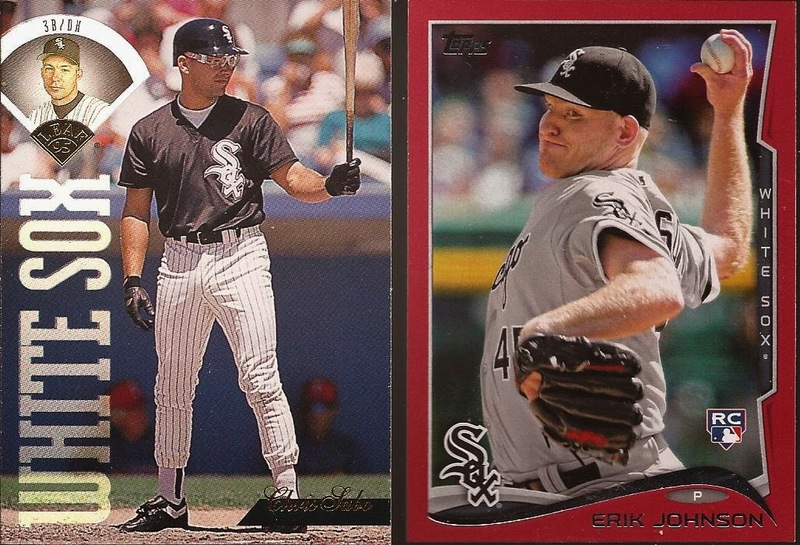 On Friday, I received a PWE from TJ, the man who really REALLY needs all your Griff Jr. cards from Junior Junkie. I was getting ready to scan a super PWE (his words) I received from Pat at Hot Corner Cards. 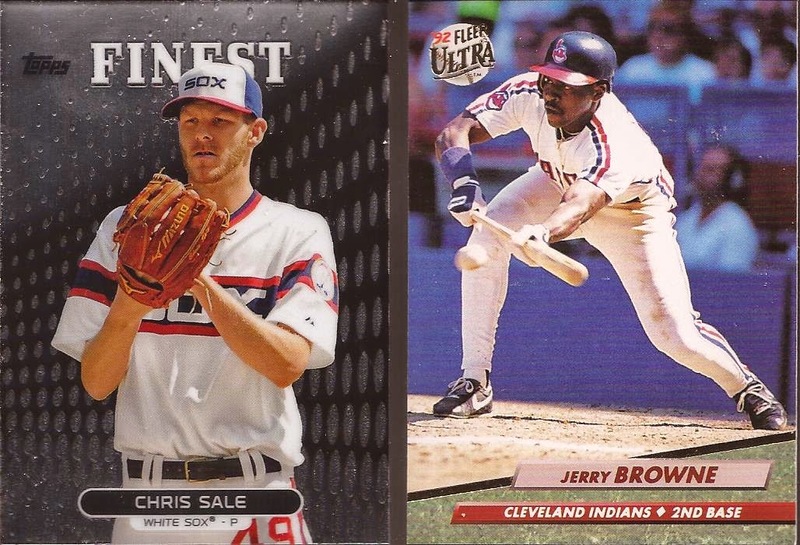 They both happen to have 6 cards in them, so let's put the cards side by side and see which one really is the super PWE. Let's get it on! TJ is on the left in all these images, with Pat's offering to the right. First off we have a Sabo Leaf up against a Bowman Topps Target parallel of Erik Johnson. While Pat's is a rookie, the red border just doesn't work with our road uniforms. Plus, it's hard to beat Sabo's goggles. AJ 1 Pat 0. An Aparicio CYMTO versus this year's GQ offering. 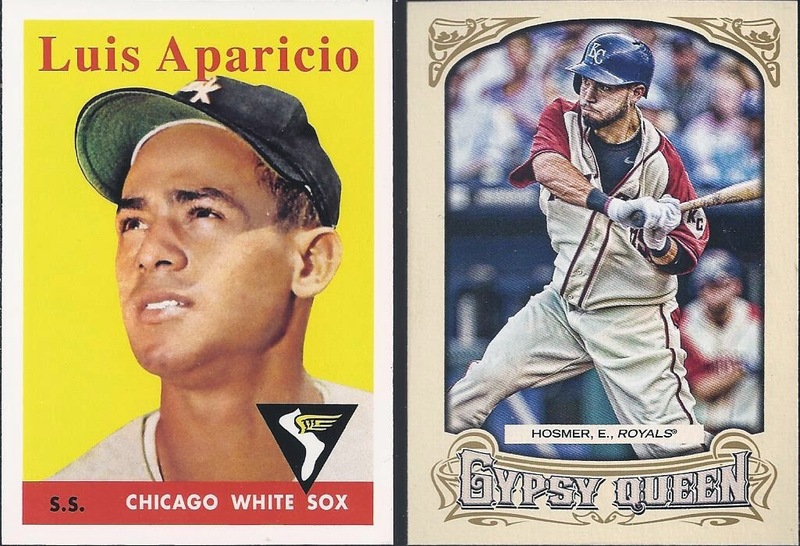 Topps went real throwback heavy in the 2014 Gypsy Queen release, and I love it. You have the mark of the beast coming out from under Hosmer's open uniform, but it still takes the win this round. AJ 1 Pat 1. Tough round here. Sale finest, in a throwback, up against Jerry Browne laying down a bunt. 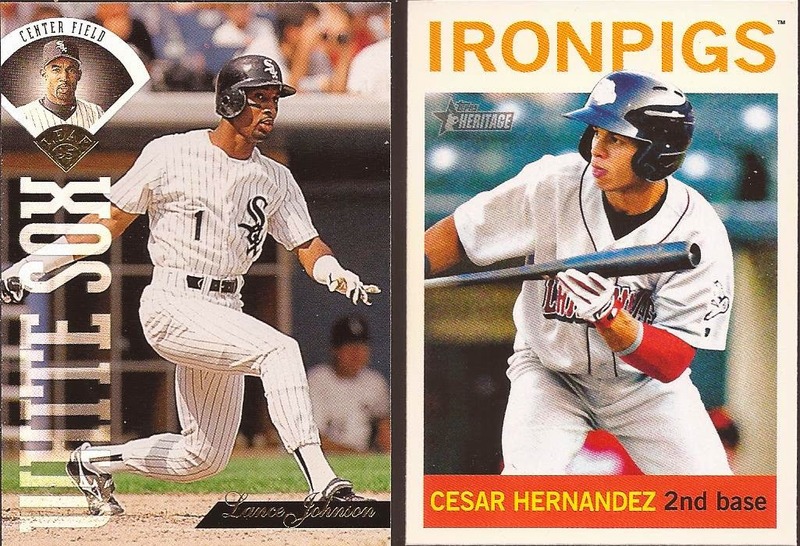 Two amazing cards. The bunt is great, but the Finest wins the round. AJ 2 Pat 1. One Dog against a minor leaguer bunting. Double flap alert on the Gazoo helmet, but the bunt pose takes the win. AJ 2 Pat 2. Mike Devereaux actually hitting the ball or Aybar skying to make the turn at second, with a cameo by A-Rod. Like I have to think this one over. AJ 2 Pat 3. Junk wax against A&G. I love A&G. Have a whole page dedicated to my wants for the product. So this round goes to......wait a minute. What is that Kenny Williams is holding in his hand? Is that a shard of a bat? Yes. YES! 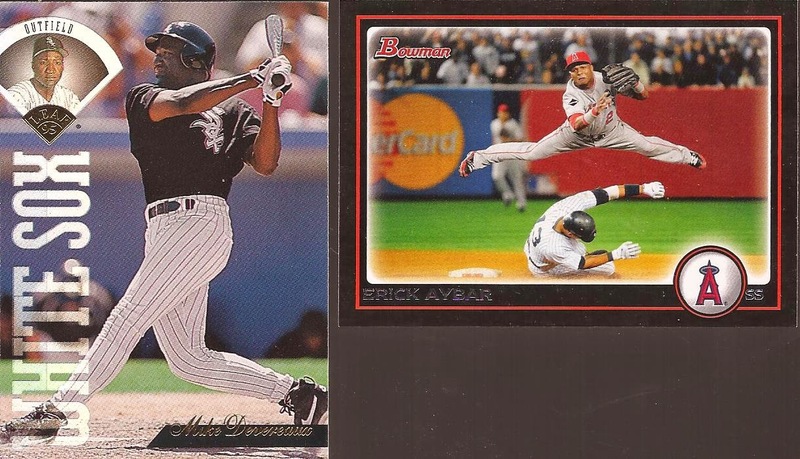 We have an elusive broken bat card I have not known about. A&G will have to take a back seat to a broken bat gem. AJ 3 Pat 3. So in the six cards, head to head, we have a tie. To clear this dead lock, I suggest AJ and Pat send in 6 more cards to be tallied. Did you notice that bunting Jerry Browne is a reverse negative? 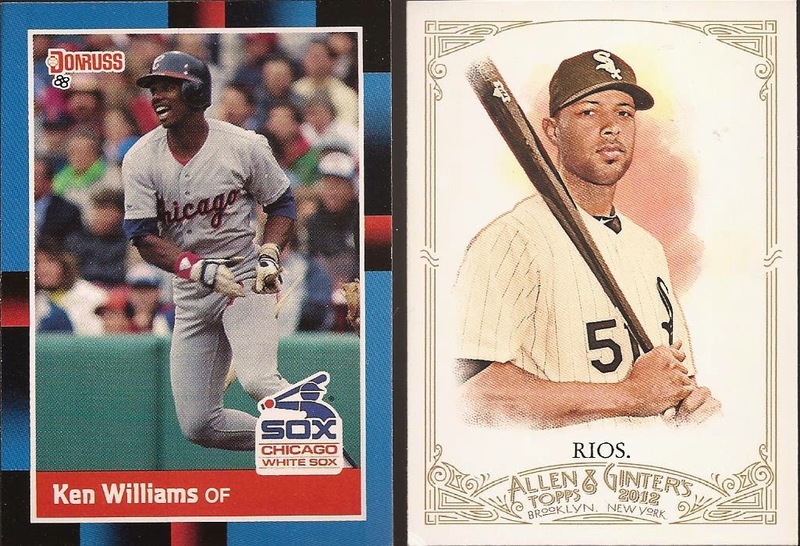 I'm going to go through my dupes and pull a big trade package for you from your mini-collections. Let me know if you want any White Sox too.